HP has announced a new line of desktop workstations designed to meet both the compute and security needs of today’s workforce as they tackle solutions using emerging technologies such as virtual reality and machine learning. The company’s new Z desktop workstations feature a wide range of comprehensive security features including SureStart (the first self-healing BIOS with intrusion detection) and HP Client Security Suite as well as a host of others. Cyber threats have evolved and the company has designed a line of PCs ready for the challenges ahead. All of the new workstations can be outfitted with Thunderbolt 3 ports as well as Dual 1GbE ports to allow data and video to flow freely to and from these machines. The HP Z8 stands out from the rest of HP’s lineup because it is the fastest and most powerful workstation currently available from the company or its competitors. The Z6 and the Z8 will also support dual CPUs as well as optional dual 10 GbE network modules for high speed networking at a fraction of the cost of HP’s previous workstations. The device can even be fitted with up to three TB of main memory for additional rendering power. 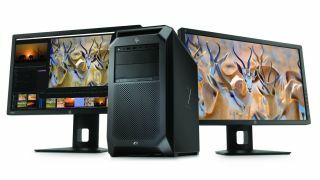 The HP Z8 Workstation is expected to be available in October with a starting price of £4,100 and the Z6 will retail at £2,300 during the same time period. In December, HP will also sell the Z4 Workstation at £2,100.